Contrary to popular belief, packing for our family does not start many weeks before we set off on our travels. In fact, it is very last-minute indeed. The holiday packer in any family will agree that it takes grit and determination to pack for your break away, whether you’re heading off on a two week beach holiday, a two month road trip around Europe or taking the kids on a tour of the best places to visit in Orange County. With less than 48 hours before we head off for our first stop in Germany this morning will see the the packing process begin. Most of it will be done today and the last few bits and pieces finished off tomorrow as the laundry is completed. 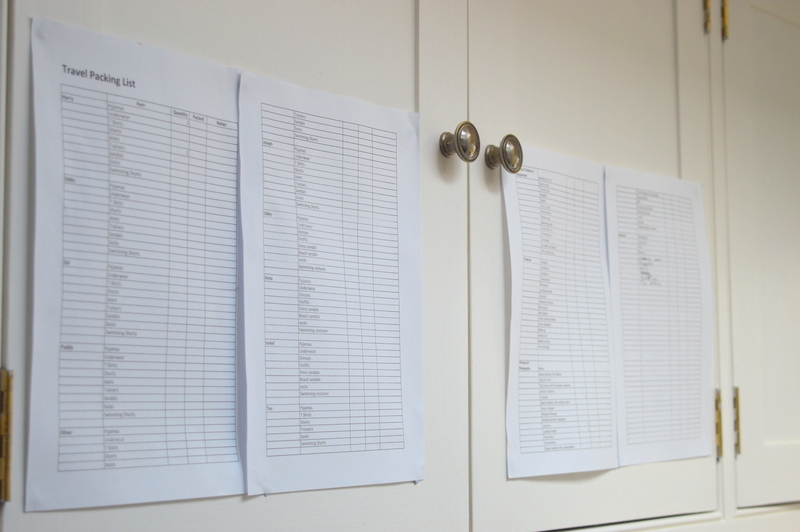 Lists and spreadsheets are vital for organising packing for 13 people for almost two months. There are lists everywhere: the computer, notepads, my mobile phone, in my head and, so that everyone can see and add to them, on the kitchen cupboards too. I have a basic spreadsheet set up which includes various packing categories including a segment for each child, one for children’s equipment, one for toiletries, one for technical equipment and so on. Cait packs for herself so at least that is one less thing for me to worry about. But it still leaves 12 others! Not only do I have my packing list to get through but also my baking list. With a 12 hour journey to endure we need to make sure we have enough food to last. As we will be eating as we drived along we need to make sure that any foods don’t pose any choking hazards that would need emergency stops on the motorway. The sausage meat is being defrosted for several homemade sausage rolls to be baked first thing tomorrow, over a hundred cake balls have been made already. So this is how things look in our house this morning. Packing, food and lists, lists, lists! Anyone care to volunteer? No, didn’t think so…! If you saw the state I was in earlier today you’d be terrified! hahahaha love those lists. My wife started doing a list the first time we travelled with our daughter and I teased her about it. Since then I can’t live without the packing list!